Last month, Verizon Wireless rolled out the Samsung Rogue, an upgrade to the Samsung Glyde. The Rogue overcomes many of the issues the Glyde faced, now sporting an improved touch screen, a faster interface, and a sleeker body. The Rogue features a 3.0 mega pixel camera and a large 3.1-inch display, but is still an ideal device for SMS addicts due to it’s slide out QWERTY keyboard. The Samsung Rogue shares the same form factor as the Samsung Glyde, a sliding keyboard under a touch screen, but it has a new look. 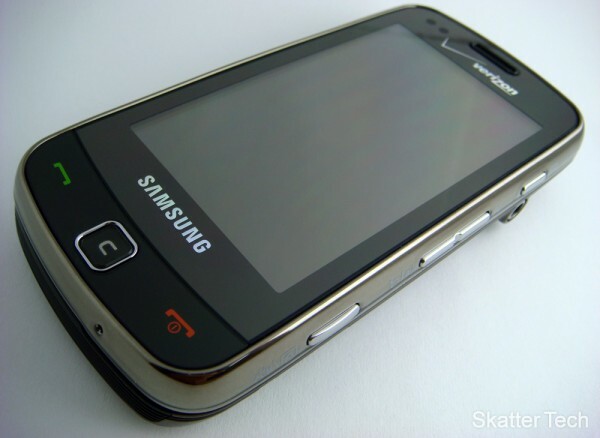 Although this phone is taller than the Glyde, it is thinner and has a more streamlined finish. The face of the phone is very simple. 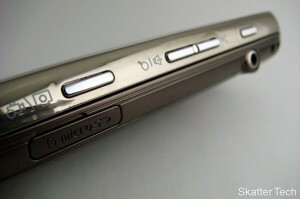 Underneath the 3.1″ touch screen, there are three “brushed metal” buttons: send, clear, and end. The back of the phone has a rough bronze-colored texture, which offers a decent grip. The speaker, a 3.0 megapixel camera, the flash, and a tiny mirror for self portraits are on the back. The position of the camera causes one small issue. 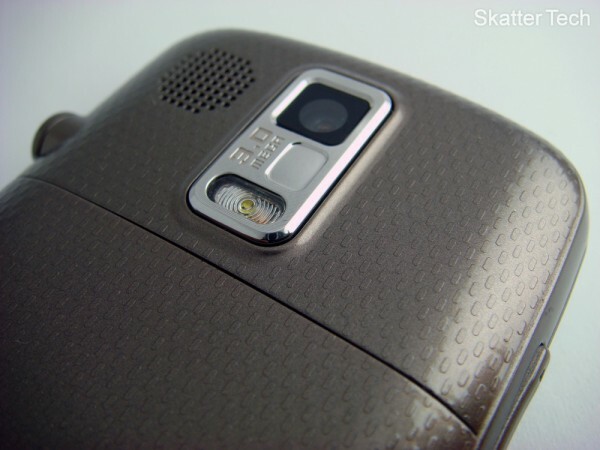 Each time I picked up the phone, I had a tendency to place my index finger directly on the camera lens. I found this to be annoying since it was a pain to continually have to clean the lens, but then again, this might be an issue only for me. The volume controls and the USB connector, used for both charging and data transfer, are on the left side of the phone. On the right side there’s a screen lock, voice command, a zoom in/out button for the camera, and a camera capture button. 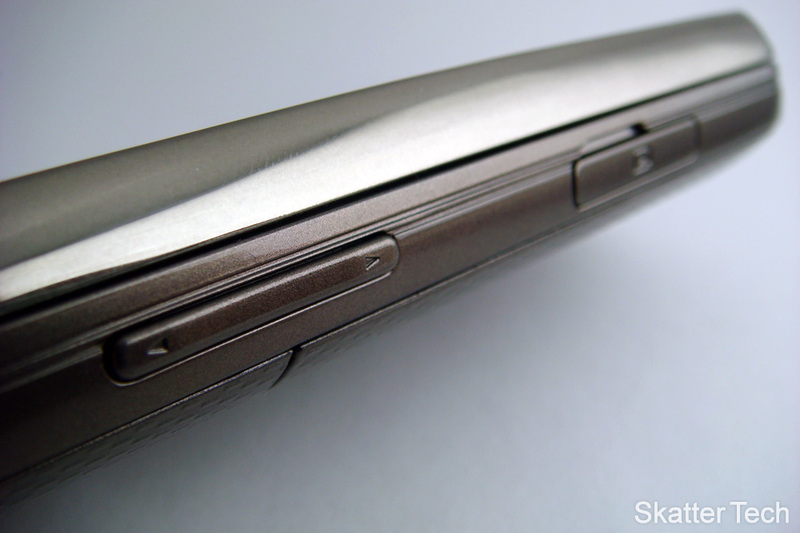 The lower portion of the right side features the 3.5mm headphones jack and the microSD expansion slot. Verizon Wireless advertises the Samsung Rogue as great phone for texting. Therefore, I expected it to have a great keyboard, unfortunately, it was a big disappointment. There are four lines of keys instead of having a additional symbol function. This makes things easier to find and faster to type. The keys are not small or cluttered, but are neatly spaced out. Unfortunately the problems begin with the layout of the keys. Some buttons are too far off to the left and others are properly centered. Even though the keys feel great to type on, their locations don’t feel natural. They feel as though they are a bit jumbled and not placed in traditional keyboard format. I was impressed with the 800 x 480 pixel (AMOLED) touch screen display. With a higher resolution than Apple iPhone’s 480 x 320 pixels, the Samsung Rogue’s display looked beautiful and had rich colors. Even with a mid-range brightness setting, the display was fairly visible even in direct sunlight. The Rogue also has haptic feedback. Every click results with a small vibrating pulse in addition to audible feedback. A built in accelerometer changes the orientation of the display automatically from portrait to landscape and vice versa. A proximity sensor automatically turns of the display when the phone is held up to your ear to save battery life. To lock the phone, there’s a physical side button. To unlock it, just press any button so the display turns on, then click the on-screen unlock button. The home screen is quite customizable, you can change the brightness, the banner, change the text font, the wallpaper, and even the clock format. There is a collapsible side bar that holds all the supported widgets. You can easily drag the ones you use the most on to the home screen by simply dragging them over. There’s an analog and digital clock available as a widget as well. On the bottom of screen, there are two rows for actions. The first row is for notifications for missed calls, voicemails, text messages, calendar, alarm clocks, and more. The second row contains four buttons for the phone dialer, contacts, messaging (text, picture, email, etc. ), and the full menu. These two rows are static and can’t be customized. It would be a great idea if they offered the ability to dock other programs such as the web browser or media player to that menu. In general, the user interface is clean, simple, well designed, and works! The call quality was excellent, plus there were a few extra unique features added in. For example if you are in a library or a lecture hall and have to whisper, there’s a mode for that! Just click the “Whisper Button” and it amplifies your voice so it sounds almost normal for the person on the other end. For the most part, the regular voice quality was excellent on both ends, no complains. The only reason the phone didn’t live up to a five star rating was because of the speaker phone. The speaker wasn’t loud enough or clear enough. It works fine if you are in a truly silent room, but it’s quite difficult to hear when in a car. If you normally use a Bluetooth headset, you won’t need to worry about this. Just like most phones today, the Rogue supports text, picture, video, and voice messages. Text conversation history is saved to keep track of everything that’s been said. 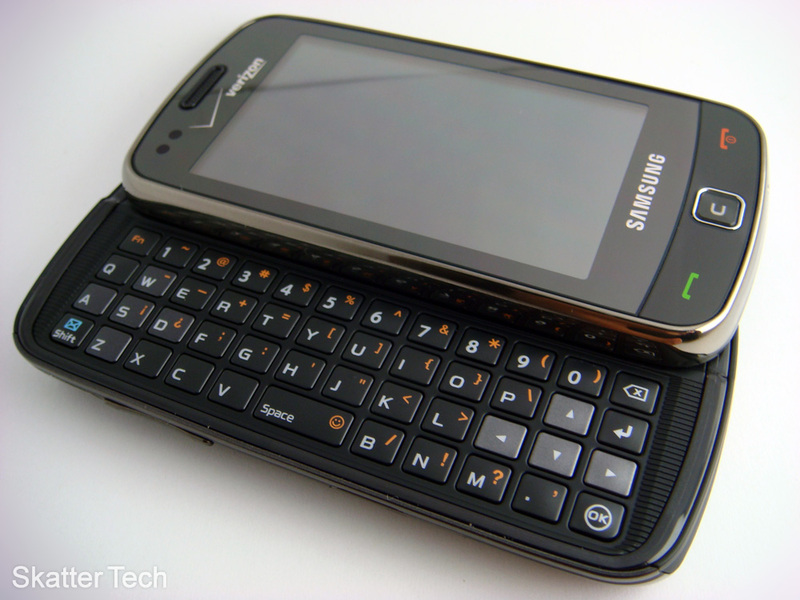 You can compose a message with either the pull out QWERTY keyboard or the on-screen digital keyboard. The digital keyboard isn’t in a QWERTY layout, but a normal alpha-numeric keypad. This was a feature I was truly excited for. It theoretically allows you to say a phrase to your phone, which should automatically be converted into text. Unfortunately this feature barely worked. Even after training my voice, I only had successful results about 25% of the time. The rest of the time, the program types in something completely incorrect. For it to work, you’ll have to speak very slowly and clearly, emphasizing each word. For example, I said “This is a cell phone review” and the program typed in “This is itself under view”. It doesn’t accept slang too well either. Another example, I said “Let’s go see Zombieland at 10 o’clock” and it typed in “Left to see some reliant@koch”. To wrap it up, this feature is a great idea, but needs a lot of work. For now it’s not worth using; it’s faster to type the message yourself. The camera on the Rogue has all the standard features you would expect: zoom, flash, and focus. There are alternate image options such as mosaic, frame, panoramic, and multishot. Image resolution and brightness are also modifiable. After you take a picture, you can edit it with some fairly cool effects. In addition to the standard effects such as sepia and black & white, some other effects such as sketch, emboss, soft-elegant, and fright are thrown in. For the most part, the camera takes excellent photos. The only issue I faced was a small lag from when you click the capture button to when it actually takes the image. If you make any sudden movements, it looses focus. That results in blurry image quality. The camcorder mode can record video only limited by the available space on the memory card. However you can only MMS clips that are a max of 30 seconds. It records at a 640 x 480 pixel resolution. There are five recording effects, similar to the ones for the camera. Quality looks fairly good for a phone, but gets choppy at times. It obviously isn’t comparable to a decent camcorder or even a Mino Flip. The Samsung Rogue was designed to be a full MP3 player with a standard 3.5mm headphone jack. The media player has a search function and lets you browse your library by Artists, Genres, and Albums. During playback, the album art isn’t shown on the full screen, but rather as a thumbnail. Other than that, the interface is quite nice. Controlling playback, such as play/pause, next track, and so on, are easy to use and work without any problems. The media player has a shuffle and repeat mode. The audio quality with headphones was great and it didn’t cackle when turned up too high. The speaker on the other hand was an issue. They just weren’t loud enough and wasn’t clear. Another major issue is the lack of multitasking. You can’t do anything else while playing back music. Phones such as the LG enV Touch allow browsing the web, texting, and doing other things while the music player runs in the background. This is a major drawback and needs to be addressed. There are a lot of other features that this phone offers. Some built-in tools include a calculator, a tip calculator, and a unit converter. The Rogue also syncs to your computer with the included USB cable to transfer music and data. The media player also supports playing video files, however quality isn’t too great and supported file formats are limited. The web browser was impressive. It still isn’t on par with a browser such as the one found on smart phones such as the iPhone. But for the most part it has all the essential features such as navigation, favorites, and zoom. It rendered most pages fairly quickly as well. The VZ Navigator works really well. The GPS module tracked my location very precisely. I do feel that the navigation interface could use a bit of a face lift. The program also offers voice turn-by-turn directions, but once again the poor speaker quality was an issue. Another truly unique feature is the business card reader. All you have to do is take a close up image of a business card in a fairly well lit location. It automatically scans the card and creates an entry in your address book with all the information from the card. It worked really well with just about every card I tested it on. The final feature I’d like to note is the document viewer. It supports viewing Microsoft Office files (Word, Excel, and Power Point) and PDFs. The interface allows scrolling and zooming for all files. To get files onto the device you can simply copy them onto a pre-created folder on the microSD card or sync them over using the data cable. After spending a little over a week with this phone, I was fairly satisfied. I was impressed with some of the rather unique features such as the voice-to-text and the business card scanner. The largest drawbacks were probably the odd layout of the slide-out QWERTY keyboard and the quality of the speakerphone. Other than that, the phone performed quite well. The home screen is one of the best parts of the user interface experience. The phone excelled in the most import aspect, call quality. I suggest going into a Verizon Wireless store to handle the phone before buying it over the phone or online. If you are ready to buy it, the Samsung Rogue is available online for price of $99.99, with a 2 year contract. Great review, I have this phone and your comments are accurate for the most part. My only disagreement is regarding the voice recognition feature. Plese note that there is an option for additional voice training AFTER the initial voice recognaition training. This additional training is an absolute must in order for the voice recognition feature to be of any value. While it takes more time and effort it is necessary and thereafter the voice reconition aspect works very well. Thanks and keep up the good work. Rogue unlocks in my pocket all the time. you want to know what else gets unlocked down there? Is it Sold in the u.k? what stores can i find i in. definatly a must have. i want it sooooo bad!